RED TOURMALINE SUGARLOAF CABOCHON (BRAZIL) – 2.51 CT.
A very attractive medium-toned red sugarloaf tourmaline cabochon that’s very clean for a Type 3 gem. 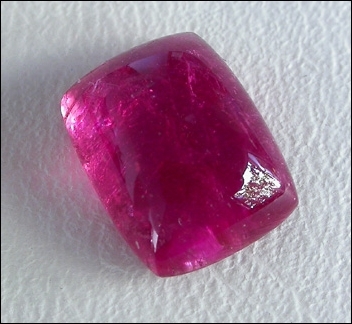 It has vibrant pinkish-red color and an excellent cut. It measures approx. 6.8 x 8.8 x 4.3 mm. I’m finding it difficult to get new material of this color and quality in the current market. October birthstone. (All uses, possibly H and R).